Squadron Leader Phil Smith’s old problem was back. As the Flight Commander, ‘A’ Flight of 467 Squadron, one of his duties was to allocate crews to particular aircraft for operational flights. While some aircraft were always flown by the same crews, there were also some ‘orphan’ bombers on strength with the Flight which had no normal crews and which were flown by whoever was available on a particular night. Individual Lancasters varied greatly in quality and performance, depending on how hard they had been flown, and in every Squadron or Flight there were always one or two ‘dogs’ which no-one wanted. And, on A Flight, 467 Squadron, no-one wanted EE143, the aeroplane we last saw in late March that wouldn’t fly straight. It seems that Avro had been unable to find a fault with its structure or dimensions and so the aeroplane was back at the squadron. Unwilling to send it on operations without a test flight and unwilling to force anyone else to so it, Phil decided today to take the aircraft up himself. His logbook does not specify the crew he flew with but it’s likely that at the least flight engineer Ken Tabor went with him. Navigator Jack Purcell did not record this flight in his logbook so it was probably intended to be a local flight only. In any case, Phil took off into a fine and sunny sky and headed towards Syerston, another RAF station about 20 miles south-west of Waddington. Meanwhile, Waddington was gearing up for operations again tonight. It would be another long one, though not quite as far as the Munich trip two nights ago. This time the target was Schweinfurt. Bomber Command had attacked Schweinfurt properly for the first time only in February, which incidentally was one of the operations on which Phil Smith took EE143. Notwithstanding the mistaken bombing by crews who thought they were at Nuremberg in March, the city had more or less been left alone ever since. It was still however the centre of Germany’s ball-bearing industry, and since Sweden had reportedly ceased its supply of that resource Schweinfurt now assumed an even greater importance and Bomber Command Headquarters decided it was time for another attack. Strongly defended with smoke screens and decoys and well beyond Oboe range, it was a tricky target and it was thought that the recently developed No. 5 Group marking tactics might prove successful. 226 aircraft were sent. The Waddington contribution to the force was intended to be 30 aircraft, but three 467 Squadron crews were cancelled. One (Pilot Officer Len Ainsworth) had gone sick and one missed for unrecorded reasons (Pilot Officer Tom Davis), but the third was the result of an accident. Flight Lieutenant Jack Colpus’s crew were readying their aircraft for the operation when the mid-upper gunner’s clothing accidentally fouled the mechanism of his guns, and they started firing. The bullets hit the perspex of the rear turret which shattered, lightly injuring the rear gunner who was inside it at the time. Because of the shock and the damage to the aircraft, the crew were stood down from the operation. Perhaps Phil Smith was also supposed to go on this operation. But it’s also possible that he stayed at Syerston overnight after landing there on his test flight. His logbook records another test in EE143 the following day, and the aircraft does not appear to have been on the Schweinfurt operation. There’s insufficient information available in the records to be sure either way.His logbook records landing at Syerston on the test flight in EE143, and another air test in the same aircraft the following day. EE143 does not appear to have been on the Schweinfurt operation so it’s possible that he stayed away overnight. Three other members of Phil’s crew, however, did attack Schweinfurt. Gilbert Pate again flew with Pilot Officer Bill Mackay and Jack Purcell went with Pilot Officer John McManus. It is also likely that Eric Hill flew as part of a scratch 463 Squadron crew captained by Wing Commander Willie Tait. The bombers began to take off from about 21.15, their track south passing the now familiar waypoints of Reading, Selsey Bill and Cabourg. 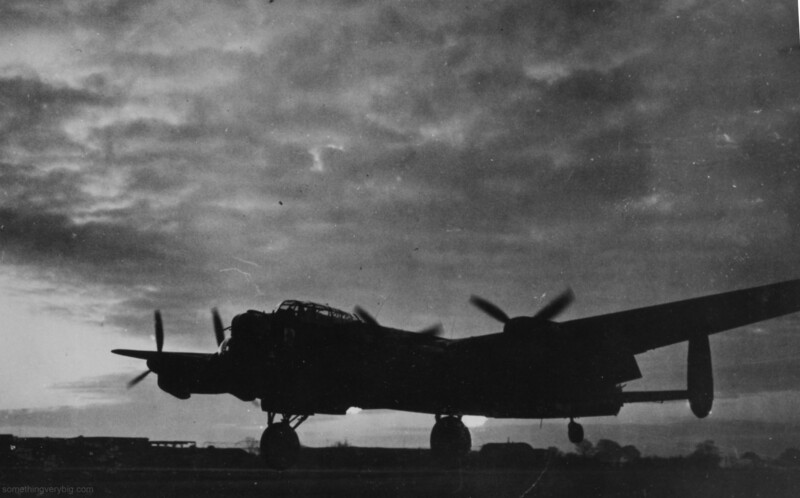 Bomber Command despatched more than 1,000 sorties again tonight, for the fifth time in nine nights. The biggest group attacked the Krupps works at Essen, an accurate raid by 493 aircraft. 217 aircraft caused great destruction to the railway yards at Villeneuve St George, south of Paris. Stirlings attacked railway targets at Chambly, Mosquitos went to Hamburg and carried out intruder patrols and Serrate patrols, a small force of heavies laid mines and there were some Resistance operations. Meanwhile, all was not well in the aircraft that had departed Waddington. Three crews made early returns. Pilot Officer John Sayers, in ED657, had been late to take off after an engine overheated on the taxiway. He tried to make up time by tracking direct to Cabourg and flying faster than usual but the need to run at a higher engine power setting caused the recalcitrant engine to overheat again. To keep height it was necessary to jettison the full bomb load and they limped back to Waddington, landing just before 1am. And passing Peterborough about half an hour after departure, Pilot Officer Fred Cassell’s rear gunner, Flight Sergeant Max Milner, reported that his rear turret was unserviceable. On investigation it proved impossible to repair while airborne, so Cassell decided to abort the mission. He turned east and flew half-way across the North Sea to jettison his incendiaries and returned home with the 4,000lb ‘cookie’ still in the bomb bay, landing just after 3am. but was unable to stand up and was having trouble in breathing. He was in much pain and was getting worse as height increased. Confirmation can be obtained from Medical Officer. They flew over the sea to a point sixty miles east of Waddington to jettison half their incendiaries and brought the rest back home. The crews who had attacked Munich last night only returned to Waddington between six and seven this morning. Consequently aircrew were rather scarce for most of the morning. It was therefore no surprise for Flight Lieutenant Jim Marshall and his crew when they returned from Ford this morning to find that a stand-down had been declared. Following the large effort the previous night most of the rest of Bomber Command was also stood down tonight. But some crews still sallied forth across the North Sea. Three Mosquitos attacked Cologne, 25 Stirlings laid mines off the northern and western French coasts, nine Wellingtons scattered leaflets over Northern France and a single Mosquito made a weather reconnaissance flight. No casualties resulted from the night’s operations. The Munich raid of 24 March 1944 was an attack delivered almost entirely by No. 5 Group, Bomber Command. It used, for the first time, a variation of the low-level marking system which had been so successful over French railway targets. The first wave of the bomber stream overflew the target without bombing to provide support to the flare force which dropped hooded white flares to illuminate the target area. The Main Force then continued on a short distance and orbited, clear of the defences, north-west of the target, awaiting the order to come in again to bomb. “The idea of flying through the target area while waiting for order to bomb is in my opinion totally unnecessary, particularly so on a target such as Munich,” seethed Pilot Officer Bill Felstead later. “Suggest orbit away from a defended area,” said Pilot Officer Arthur Bowman. But it seemed to work. The four target-marking Mosquitos led by Wing Commander Cheshire “arrived punctually at the moment when the first flares were dropped.” Conditions were clear and visibility was almost perfect. Cheshire swooped in at around 700 feet and reportedly dropped the first flares while coned in searchlights and lit by the flares falling from the Lancasters above. Under fire he managed to identify the aiming point and dropped his red spot fire markers accurately. The remaining Mosquitos followed to back up the original markers and the first wave of the Main Force, still circling to the north-west, could now be called back in. The exact middle of the photo is where the bombs theoretically would land and this apparently was directly over Hitler’s favourite beer parlour. I received a message from Group saying that whilst war is a dirty and bloody business it was considered bad form to go around destroying the opposition’s pubs. The fires brightly illuminated the target – one crew said it looked like a photograph – and features like individual streets and even church spires stood out clearly. Phil Smith could easily see the river as B for Baker left the target. A wireless failure meant that they could not receive the order to “bomb the red spot fires” which was broadcast around 01.44. Instead they stooged around and simply attacked when they saw other aircraft bombing. The bombing was undershooting and became a little scattered as the attack went on, but it did not matter. The ground defences appeared to be almost overwhelmed by the ferocity and force of the attack and were putting up a much reduced effort by the time the bombers left. Many smaller fires joined into large conflagrations and an hour after the attack, a large area of the centre of Munich was burning so strongly that the reconnaissance aircraft encountered trouble from smoke at 19,000 feet. Now began the long flight home. The glow from Munich could still be seen as far as the French border. Fifty miles north of the nominal return track, crews could see fires burning at what looked like Karlsruhe. Few fighters were reported by crews returning from Munich, and it appears that the four different streams heading across Europe earlier in the evening – the Munich force, the Karlsruhe force, the OTU diversion and various groups headed to France – successfully thwarted attempts by the German fighter controllers to guess the target. The Night Raid Report suggests that for much of the night the Germans anticipated that Nuremberg or Frankfurt would be attacked. At least one aircraft did fall to a fighter over Munich, however, and others would be lost at Ulm and Strasbourg in the first two hundred miles of the homeward journey. At least one crew was attacked by a fighter after stumbling off track over Paris. The rear turret was unserviceable and neither gunner saw the enemy aircraft but Dave Gibbs’ evasive action was successful in losing the fighter. Dawn was approaching as the stream crossed the French coast on the way home and it made many crews nervous. Strong headwinds slowed the return journey and sapped already stretched fuel supplies so numerous aircraft diverted to aerodromes in southern England. Two 467 Squadron aircraft were among those that diverted: R5868 (S for Sugar) with Pilot Officer Tony Tottenham and crew landed at Market Harborough, fifty miles short of Waddington, and DV372 (F for Fred) with Flight Lieutenant Jim Marshall and crew, landed at Ford, just after safely crossing the English coast at Selsey Bill. The Munich operation of 24 April, 1944, at ten hours and five minutes, is the longest flight to appear in Jack Purcell’s logbook. It was so long that several wireless operators (among them Sergeant Macdonald on Flight Lieutenant Jack Colpus’ crew) tuned their radios to the BBC news while airborne over England on the way home, and heard that Munich had been bombed last night and ‘x’ aircraft had failed to return. And they hadn’t even landed yet. The roundabout routing – while long – achieved its goal and casualties were much lower than usual. Nine bombers failed to return from Munich: four by flak, three by fighters and two to unknown causes. Sadly, one of the missing aircraft was a 463 Squadron machine. Pilot Officer Eric Page and crew disappeared in LL848. This was most probably the aircraft seen to fall to a fighter over Munich. They crashed near the village of Sulzemoos, sixteen miles north-west of Munich. There were no survivors. A few days later Gilbert Pate sent one of his many letters home to his parents in Kogarah, in Sydney’s southern suburbs. He included the front page from Wednesday’s Daily Mail newspaper, which he had pinched from the RAF Waddington Sergeant’s Mess. …By night the battle is more severe. Munich and Karlsruhe, deep inside Germany, were still burning yesterday after Bomber Command’s great attack during Monday night. Operating in very great strength the R.A.F. showered more than 500,000 incendiaries and a great weight of high explosive on these two manufacturing and transport centres. …The Munich raid lasted from 1.35am to 2am. It was described by the Germans as the city’s ‘worst ever’. ‘We must not be broken by the terror; we must answer it with a soldier-like courage’, said a radio spokesman. 467 Squadron Operational Record Book, 09MAY44. At Waddington, the crews were making a similar discovery. Like their comrades at Skellingthorpe, they were off to Munich, deep in the south of Germany. But, in one of the more extravagant examples of route planning during the war, the bomber stream would fly south over France, cross into Italy almost to Milan before turning north over the Swiss Alps and setting course via parts of Austria for their target. In a sign that this attack would be aimed directly at the city itself rather than its industries, bomb loads were almost entirely made up of incendiaries. Only two crews carried high-explosive bombs from Waddington. Squadron Leader Bill Brill captained one of them. The other was Phil Smith’s crew. They took their normal aeroplane, LM475 B for Baker. Phil had a second dickie pilot along for the trip as well. Pilot Officer Tom Davis was on his third observation trip as a new captain, having in the past week flown with Bill Mackay to La Chapelle and Brunswick. The Munich raid would be carried out by a significant force of heavy bombers. In all 244 Lancasters and 16 Mosquitos were sent, mostly from No. 5 Group. But this would not be the biggest operation of the night. 637 aircraft were sent to Karlsruhe, just over the French border near Strasbourg. The raid would be spoilt by unexpected cloud over the target and strong winds which affected the accuracy of the Pathfinders. Various parts of the Main Force even got lost and bombed Mannheim (30 miles to the north) and a small number of other German cities instead. Nineteen bombers failed to return. Elsewhere, a small number of Stirlings attacked a railway target at Chambly in France, Mosquitos bombed Dusseldorf and there was also the usual mining sorties (off French ports and the Frisians), Serrate and intruder patrols, leaflet drops and special operations. 165 OTU aircraft made a diversionary sweep over the North Sea, getting within 75 miles of the coast (two were lost). 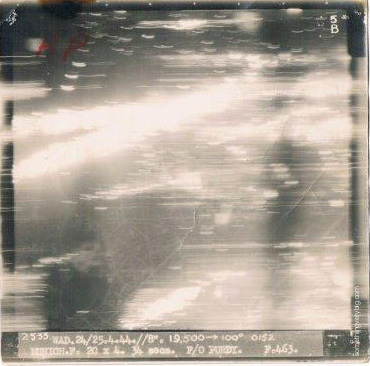 And finally, in direct support of the Munich operation, six 617 Squadron Lancasters dropped target indicators and flares only – no bombs – as a diversion on Milan. Take-off was from around 20.45 in the evening. 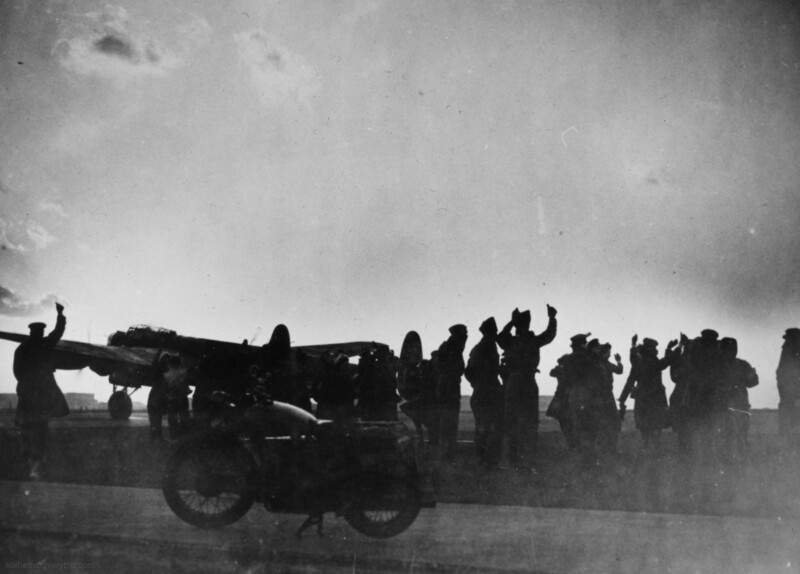 With Double British Summer Time in force, sunset was not until around 11pm local time so for once, the ‘send-off party’ of WAAFs and ground staff who gathered at the end of the runway each time the Squadrons took off for an operation were clearly visible. The bombers crossed the French coast near Cabourg and headed south. Near Orleans they turned more towards the south-east and aimed for a point which would see them skirting just south of the Swiss border. Before they got there, though, Pilot Officer Col James of 463 Squadron encountered carburettor icing in all four engines north-west of Lyon. They were unable clear the fault and, struggling to maintain height and with the very high terrain of the Alps looming further down the route, it was pointless going on. With heavy hearts they turned for home, having already flown almost as far east, and a good deal further south, than they did when they went to Aachen almost two weeks ago. They landed at Waddington having been airborne for a tick over six hours. The Aachen trip took them four and netted them a full operation onto their individual tallies – but frustratingly, this early return would get them nothing. Meanwhile, of course, the majority of the force flew on. Near Lake Annecy they turned east and were treated to spectacular views of the Alps to starboard and the spoof flares and target indicators going down on Milan to port. (To assist with the deception, the crews carrying out the Milan part of the operation were reportedly told to use their radios to issue instructions and talk on the VHF as if a major attack was commencing.) Pathfinders dropped red route markers at turning points over the Alps and they “made a terrific sight cascading down the sides of snow covered mountains.” 165 miles east of the Annecy turning point lay a further route marker to indicate the rendezvous point. To ensure saturation of the defences it was essential that the bomber stream remained compact when it arrived at the target. Crews were therefore ordered not to leave this point until a specified time. At that time, the bombers turned north-east and flew almost directly towards Munich. They crossed Switzerland and Austria and then, fifty miles ahead, was the target. Quoted in a letter by Dale’s father Charles Johnston to Don Smith, Phil’s father, 16JUL44. Part of Mollie Smith’s collection. Sleeping off the fatigue from last night’s flying, there were no operations planned for the airmen of 463 and 467 Squadrons tonight. After about midday, however, some training was organised. 463 Squadron carried out some fighter affiliation sorties but Phil Smith and his crew took B for Baker to the Wainfleet range, about thirty miles west of Waddington, for some high-level bombing practice. The sortie lasted an hour and a half. Following this they did another test flight, again at the request of Avro, in W5004, the aircraft Phil had tested the previous day. This time Jack Purcell came along too, for another half an hour in the air. The aircraft does not appear in either logbook again so it seems that whatever fault it carried had been cured by the two air tests and it was cleared to go back into service, albeit with a training unit rather than an operational squadron. Bomber Command aircraft on operations on this night included a small group of Stirlings which attacked a signals depot near Brussels, 25 Mosquitos which went to Mannheim and a force of 113 heavies which dropped mines in the Baltic Sea. Six Wellingtons scattered leaflets over northern France, twelve Halifaxes carried out special operations over Europe, four Mosquitos completed Serrate patrols and another one did a weather reconnaissance flight. Two Stirlings and three Halifaxes from the mining force failed to return. More operations tonight. And just for something different, the Waddington crews would leave French railway targets alone for a night and go back to a German city. But first, Wing Commander Arthur Doubleday was posted out today. The outgoing ‘B’ Flight Commander of 467 Squadron had been at Waddington since 10 December last year, and went to take command of 61 Squadron at nearby Skellingthorpe. His replacement would not arrive at Waddington for another two weeks. There was also some daytime flying. Phil Smith’s logbook records a half-hour-long “Air Test for AVRoes” in Lancaster W5004. This was not a 467 Squadron aircraft. It appears that it had come out of a period of maintenance or repair, and in May 1944 it went to 5 Lancaster Finishing School at RAF Syerston, about 20 miles south west of Waddington. It’s likely that this air test with Phil Smith was part of the re-acceptance of the aircraft after its rebuild, possibly something to do with the Avro maintenance unit based at Bracebridge Heath which was immediately adjacent to Waddington airfield. Phil did not record names of the airmen he flew with on non-operational trips in his logbook, referring to them as simply “CREW”. While this can normally be understood to include all members of his usual crew, it’s probable that on this occasion he only took the bare minimum (perhaps only flight engineer Ken Tabor). If it was only a local flight a navigator would not necessarily be required – and indeed Jack Purcell’s logbook does not show this air test. Instead, Jack flew to Predannack and back in Cornwall with a 463 Squadron crew, with a different pilot in each direction. And after all that, the crew of B for Baker were not on the battle order for tonight anyway. Pilot Officer Doug Hislop took LM475 again and the only member of Phil Smith’s crew to operate was Flight Sergeant Gilbert Pate who once more filled the rear turret of LL792 with Pilot Officer Bill Mackay’s crew. In all more than 1100 aircraft would be flying for Bomber Command tonight. The largest single raid was carried out by 596 aircraft which attacked Dusseldorf. Other operations included 181 aircraft on railway yards at Laon, diversionary raids to Mannheim, Wissand and airfields throughout north-west Europe, some Serrate patrols, leaflet flights and special operations. Meanwhile 463 and 467 Squadrons would be part of a 265-strong force of Lancasters and Mosquitos sent to Brunswick, home to 100,000 people with an aircraft component works as its main industry. For the past few weeks, Bomber Command – and 5 Group particularly – had been heavily engaged in attacks on French railway targets in preparation for D-Day. The need for more careful bombing on these sorts of operations saw the development of some specialised tactics for improved marking and bombing accuracy, mostly using low-flying Mosquitos to mark the aiming point visually with red spot fires. It was decided to see if these tactics would also work on a larger-scale city-busting attack, and Brunswick was chosen for the first test. The raid would take place in two waves. The first wave of the Main Force would fly over the target to support the ‘flare force’, which dropped hooded flares to illuminate the ground, against the defences. The Main Force was then told to orbit clear of the target to allow the Mosquitos to do their bit. After the accuracy of the markers had been assessed the Main Force would be called back in, and after bombing they would make a hard right turn and vacate the target area heading south. By this time the second wave would be approaching and would have renewed red spot fires to aim at. If the spot fires were off the target or the enemy put up spoof flares, cascading green target indicators (Wanganui flares) would be dropped to emphasise the correct spot fires for the Main Force to aim at, with full Wanganui skymarking available as an ultimate back-up if the weather failed to cooperate. And for the first time, the new ‘J’type’ liquid-filled incendiary bomb would be used in operations. The Waddington contribution to the Brunswick raid on 22 April 1944 was 20 aircraft from 463 Squadron and 18 from 467. Two pilots from the latter went sick before take-off so the final tally was 36. Take-off was from 22.30. To keep the German defences guessing, the strategy called for a twisting, turning route to the target. From England, the bombers flew eastwards to a point just north of the island of Terschelling, in the Frisian chain. They turned south-east for sixty miles, then crossed the German frontier on another sixty-mile leg heading almost due east (passing Emden at this point, off track to the north, Pilot Officer David Gibbs reported being engaged by flak, but no damage was recorded). Just when it would have looked like the target could have been Bremen, Hamburg or even Berlin itself, the bombers jinked again to the south-east, now threatening Hanover or perhaps Leipzig. The final turn to Brunswick was made south of Hanover, with a cascading green target indicator dropped nearby for the benefit of the early crews. “Numerous alterations of course on route seemed to be a very good idea”, said Flight Lieutenant Eric Scott, and indeed it was, with very few fighters seen by crews on the way out and no combats recorded. About the only trouble to befall a Waddington crew on the way to the target was a dicky engine on Flight Lieutenant Freddy Merrill’s 463 Squadron Lancaster, LL790. They climbed a few more thousand feet while the engine was still producing power, but eventually it needed to be shut down and they consequently gradually lost height until the heavy bomb load left the aircraft over the target (without the benefit of either the bomb sight or the Monica anti-fighter warning system, which were both run by power generated by the errant engine. Merrill later said that subsequently his “gunners were human Monica’s” [sic]. The Waddington crews were all to be part of the second wave. Ahead of them, the markers were going in to do their work. There was some low, broken thin cloud present and some crews had to duck beneath more cloud at their operating height to be able to bomb. The flare force illuminated the target successfully and the Mosquitos dived in to drop their spot fires. The markers were assessed as being in the right spot so the first wave was called back in to bomb. While the Night Raid Report claims that some 60% of all attacking aircraft successfully bombed the ground markers, slant visibility through the cloud made it difficult for the bomb aimers to sight the markers until they were almost on top of them, if they saw them at all. Adding to the confusion, the new J-type incendiaries were burning with an orange colour which too closely resembled the glow of the red spot fires. This was precisely the situation for which green target indicators had been included in the marking crews’ loads. The TIs were dropped, but an unspecified ‘technical hitch’ meant they went wide, a few miles south of the aiming point. By the time the second wave arrived, the scene in front of them included smoke from the earlier bombs and incendiaries, haze and cloud and a confusing mix of the unfamiliar J-type incendiaries and red spot fires burning on the ground with the occasional green target indicator slowly drifting in the air. Crews simply bombed what they could find. When attack opened 2 Red Spot Fires seen, one backed up with green T/I to the north. Principle bombing appeared around Southern Red Spot Fire. 1 red T/I seen to N.W. Some bombing seen around this believed spoof. Ran up to target after flares had been released and as first red spot fires went down. 2 markers about 1 to 2 miles apart and a red T/I were visible, so we orbited to North and approached again. One of the markers had been backed up by a Green, so we made a bombing approach. Marker and Green seemed to go out but a new Green T/I went down, and we bombed it. Red Spot Fire was then faintly visible. The bombing of the cascading green marker itself was certainly accurate. The problem was that it needed to be in the correct position itself, and at Brunswick it was not. Several crews realised that the marker was illuminating fields instead of the built-up area, but it still attracted much of the bombing. But despite the scattered nature of the attack, Brunswick was left burning with fires developing as the crews left the target. An hour later a reconnaissance aircraft reported a “large conflagration” at the city. German defences were unusually quiet. Flak over the target was only moderate or even negligible, and the fighters only arrived when the attack had been underway for some 20 minutes. “They made some attempt to harass our bombers on the way home, but even so only ten attacks were reported,” said the Night Raid Report. This was probably a result of the twisting, turning route taken to Brunswick and the distraction caused by the other bomber streams that were also out tonight. Bombers began arriving back at Waddington around 04.30. There was some bother caused by interference on the Waddington frequency but a little over an hour later all were back on the ground. Pilot Officer Charles Schomberg and crew never came back. After the war it was discovered that their aircraft – LL892 – crashed on the outbound journey a little north of track near Groningen in the Netherlands. All on board were killed. It was one of only four bombers to be lost on this trip and was the first 463 Squadron loss since Pilot Officer Gardner and crew failed to return from Frankfurt on 18 March. The raid itself had been a mixed bag. “Think it should be O.K.”, thought Flight Lieutenant Walter Marshall. He was only partly right. While six 463 Squadron crews and three 467 Squadron crews came back with aiming point photographs, only about 160 of the total force of 265 managed to bomb within three miles of the target. Areas south of the centre of the city suffered serious damage and various sites associated with the railways through Brunswick were also hit, but some of the attack also fell on open fields. As for the new ‘J’type incendiaries, they burned brightly and quickly and gave off less smoke than the standard incendiaries did. But when burning on the ground they were easily confused with the red spot fire target indicators and during ten trials conducted on operations between April and September 1944, it was discovered that they were “only half as effective per ton as the 4-lb incendiary” and production was discontinued. Of the other forces operating tonight, 29 aircraft failed to return from Dusseldorf and nine from Laon. Storr, Alan 2006, 463 Squadron p.19. Thanks also to Graham Wallace for the serial number correction.